According to the Global Property Guide, average listing prices for properties in Costa Rica have increased just over 6% year-on-year. In the last three years, about 80% of home sales have exceeded $200,000. After all, no gem can stay hidden forever. And as more and more North Americans flock to Costa Rica and tourism continues to grow, prices are bound to go up. But bargains can still be found…you just have to know where to look for them. 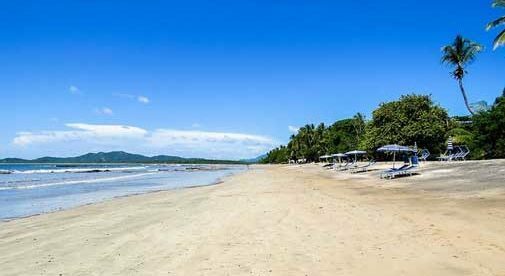 Even in my hometown, the booming beach town of Tamarindo, along the country’s ever-popular north western coast, there are good-value properties on the market. With its sprawling golden beach lined by palm trees, beach eateries and bars, and the crystal-clear Pacific water dotted with surfers and sailboats, it’s not difficult to see why Tamarindo attracts tourists and expats alike. I always describe this booming beach town as being the perfect combination of laidback and convenient. There are lots of beautiful, quiet places to enjoy the nature around you, but also all the amenities you might want, making it an ideal place to settle down. A charming two-bedroom, two-and-a-half-bathroom condo just under 1,000 square feet is currently listed for $109,000. Situated right in the center of Tamarindo, just three blocks from the beach, you are within walking distance to all the daily essentials and have access to two shared pools and barbecue areas. The condo is fully furnished with modern touches like granite countertops in the kitchen and new bathroom tiles, and classic Costa Rican flair including handcrafted hardwood furniture throughout. With one-of-a-kind interior features like custom-made Mediterranean tiles, traditional Costa Rican tile floors, and a staircase and furniture crafted from local wood, here’s another prime property that’s currently on the market. This one-bedroom, one-bathroom townhome is located quite close to the condo I told you about above. Again, it’s walking distance to everything including the beach, bars, and restaurants. An open floor plan offers plenty of living space on the first floor, opening out the back door to a private terrace and garden. This community also has a shared swimming pool and the fully furnished townhome includes a convertible bed in the living room, perfect for guests or vacation renters who need extra sleeping space. This one is also listed at $109,000. If a private home, slightly out of the hustle and bustle of town is more your style, there’s a one-bedroom, one-bathroom home located on just over an acre of land with mountain and forest views. Just outside Tamarindo, the lot is registered as an agricultural lot with an individual title and water; perfect for an avid gardener or someone interested in developing a self-sustainable garden. Great attention to detail has been taken with finishing touches including granite countertops and stained glass in the kitchen and a living area combined with amazing natural lighting make the home warm and inviting. The property is also set up in a way that would allow for expansion. The asking price is $159,000.